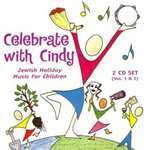 Popular vocalist, Cindy Paley, shares with us an extensive selection of songs for Jewish holidays throughout the year from Rosh Hashanah through Shavuot. Traditional Hebrew and English favorites, as well as familiar Israeli melodies, are accompanied by liner notes containing lyrics and transliterations for all 60 songs. You will love: Tapuchim U'dvash, Tekiyah, These Are The Days, Sisu V?Ë†â„¢Simchu, Sevivion Sov Sov, Oh Chanukah, The Dreidel Song, Hashkediya, Chag Purim, Lakova Sheli, Ani Purim, I Am The Afikomen, Listen King Pharaoh, Avadim Hayinu, Am Yisrael Chai, Kachol V'Lavan and More!